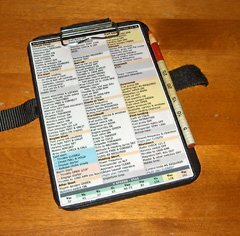 My checklist, kneeboard, and red grease pencil (held in place with Velcro®). There were items omitted that I felt should be on the checklist, such as the rolling instrument check. The 8½” x 11″ checklist was unwieldy and easily got lost among the other paperwork of a typical cross-country flight. Writing on it would ruin it, so additional paper was required to record the Hobbs times, ATIS, and clearances. I decided to take matters into my own hands and produced my own checklist in the form of a two-sided 5½” x 8½” laminated card. The front side of the card shows all the normal procedures and V-speeds, while the reverse contains emergency procedures and communications information. 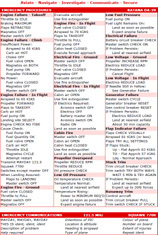 When I later got checked out in the Cessna 172N, I created a checklist for it too. 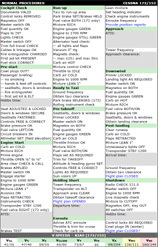 As I found myself going back and forth between the 172 and 152, depending on which was available, I merged the two checklists since there are only a handful of items specific to the 172. After flying Cessnas for a few years, I switched to a different FBO that had the Diamond DA20-A1 Katana. They too provided me with a hard-to-use paper checklist, so once again I produced my own. Below are the checklists. Click on them to view them full size and print them. They are Adobe® Acrobat® files, so you’ll need the Adobe Reader®, available here. To turn these into cards, I first printed each side separately on high quality heavy weight inkjet paper. I then glued them back to back using a glue stick while holding them up to a window so I could see both sides to ensure they were lined up. Once glued, I cut them out using a hobby knife and metal ruler, leaving 1/10″ of paper outside the printed border. Finally, I took them to the local Business Depot store to be laminated and then trimmed off the excess lamination (leaving another 1/10″) with the knife. The normal procedure checklists make extensive use of colour coding. 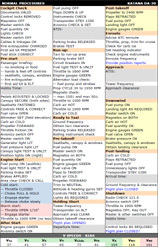 All the section headings are highlighted in green on the Cessna list and orange on the Katana list. I used two different colours so I can tell at a glance that I have the right checklist. Items written in blue text are specific to cross country flights. They can be ignored for flights for which no flight plan is filed. On the Katana checklist, the blue and pink shading is used to differentiate the cold and warm start procedures. The yellow shaded areas are sections that this particular FBO wants pilots to perform from memory, so they are highlighted for quick reference. The grey areas are for recording information. The laminated surface is perfect for writing on with a grease pencil (also known as a china marker). These are available in a variety of colours, but I prefer red as it stands out from anything printed on the checklist. After the flight, the writing wipes off with a dry cloth or paper towel. The V-speeds section at the bottom uses colour coding that is consistent with that used on the airspeed indicator. There is one non-standard V-speed, VGLIDE, which is the aircraft’s best glide speed. I’ve often wondered why there isn’t a V-speed name for that. On the combined Cessna 172/152 list, the V-speeds are given in pairs, with the 172’s speed first. Notice that all of the 172’s speeds except VA are higher than the 152’s. Note: At the airport I usually fly out of (Waterloo-Wellington International Airport – CYKF), it’s customary to do the run-up while still on the apron. This is to not hold up traffic at the hold-short position of this busy airport. I understand it’s not done that way everywhere, although I usually try to find an out-of-the-way spot to do my run-up at other airfields. That way there’s less pressure to hurry in order to get out of someone’s way. Aviate: First and foremost, fly the plane! Navigate: Second, choose a place to land if needed. Investigate: Third, try to determine and fix the problem. Communicate: Fourth, contact ATC, FSS, or another plane. Secure: Finally, prepare the plane for an emergency landing. The actual emergency procedures are straight from the POH. The last section provides some emergency communication information in case it’s forgotten in the heat of the moment. In addition to the emergency frequency (use the frequency you’re on if you’re already talking to someone) and the emergency transponder code, there’s a list of information you should give when making a mayday call. My PDA checklist, still under development. I keep the checklist on my homemade kneeboard. For a local flight, I don’t need anything else except a grease pencil and a small laminated piece of sectional chart that covers the local area. All pertinent information gets written on the checklist or chart with the grease pencil. After the flight, I fill out the required paperwork and then wipe the checklist clean. 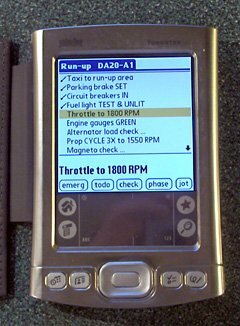 I’m currently working on an electronic checklist for my Palm® PDA. There are a number of PDA checklists out there. I’ve examined many of them and don’t particularly like any of them (they all seem awkward). I’ve used mine a few times now and am still tweaking the design to make it as effective as a printed checklist. When it’s ready, I’ll make it available on this site. I’m a 4000+ hour helicopter pilot currently working on my private pilot license for the 172. The flying clubs aircraft range from a 1962 to a 1999 with a couple early to mid ’70s in the middle. Three are carburetted and two are fuel injected. I’ve always found when the use of a specific checklist is not mandated, that building your own in a format that works for you is a good learning experience and is what will work best for you in the cockpit. I’ll take what you have here and tweak it for what I need. Thanks for all the great ideas. Very useful Cessna and Diamond flight checklist you’ve got there. You may want to share them too with other Pilots and aircraft professionals over at Expert Checklist http://expertchecklists.com/. It’s a new web app for professionals working in difficult and complex environments where users can work together to create and discuss very effective checklists for their fields. wich is better cessna 152 or the diamond da-20? Tudor, it depends on what you mean by better of course, but I much prefer the DA-20. It burns less fuel, is less crowded, glides better, is quieter, has better visibility, is more responsive, and can run on unleaded (ethanol-free) automotive fuel. Also, the oldest DA-20 is going to be at least 7 years younger than the newest C-152. Thanks For the PDF,s super helpful and organized! On the normal procedures for the C172, I’d be curious about the relative ordering of the “Carb Air – Hot” in the “Downwind” checklist. My assumption is that the purpose of this checklist item is to ensure that there is full power available if there is a TOGA event. I’m not sure how long it takes any existing carburetor ice to be melted out, but the downwind leg doesn’t take long … I’m wondering if carb heat should be first on this checklist to give the max time for ice to be melted out before the possible TOGA. David, I based this checklist on the one used by the flight school, which in turn based it on the POH for the C172, so I assume this has been thought through. I would suspect (but don’t take my word for it) that any amount of carb ice that hasn’t already caused a problem wouldn’t take very long to melt. If there were any significant amount of ice, you’d already be having engine problems. I am studying for my third class private pilot license and own a Cessna 172 of 1965 vintage. I really like your checklist for emergencies which I need as my POH does not have such a thing. 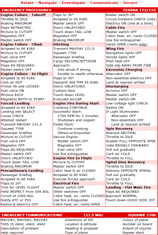 Is there anything particular to a 1965 Cessna that would be different than the emergency checklist above? Candi, I’m not familiar with the 1965 model, so I don’t really know. I would suggest going over the checklist with your instructor to determine if it makes sense, and if any items should be omitted, added, or altered. Hello Stefan. I really like your checklist layout and will create versions for the planes I fly. The write-in areas are brilliant — work great with a Sharpie fine point retractable pen. I’m curious, what software you used to create them? I used Open Office Writer, part of the free Open Office suite. If you want, I can e-mail you the files as a starting point. Thanks for the donation! Would you consider sending me the source files for the 172? I’m getting set to start flying again for the first time in 13 years (at CYKF, actually) and I’m just getting checklists together now. Hi Drew. I sent them to the e-mail address you provided. Did you receive them?